With the sudden loss from the Supreme Court of Antonin Scalia, some are calling to wait for a replacement until after the 2016 election in the interest of democracy or fairness. First, here is a useful chart providing the make-up of entire Supreme Court from 1857 through 2015. Next, three additional charts provide information to shine light upon democracy and fairness issues. The first chart shows the complete make-up of the Supreme Court with names of all the Justices from 1857 through 2015. See who exactly was on the Court at any given time, or for any decision. For example, when the notorious Roe v. Wade case came down in 1973, the Justices involved were appointed six by Republicans, three by Democrats. The second graph is a stark view of the tenure of appointments by each party. Republican appointees have controlled the Supreme Court most years, often with more than five seats. 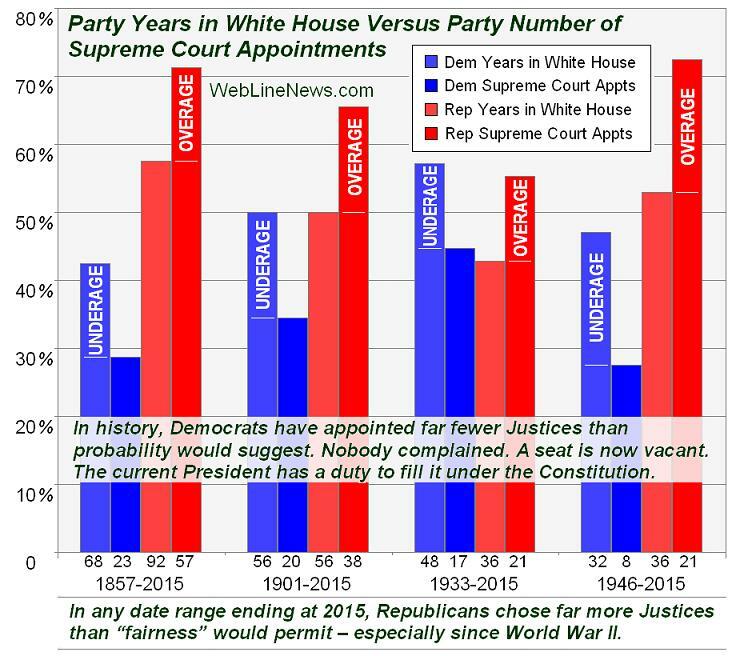 The third graph takes a look at the number of years each party controlled the White House and compares this to the number of Supreme Court appointments. Republicans have provided far more Supreme Court appointments than would be expected. 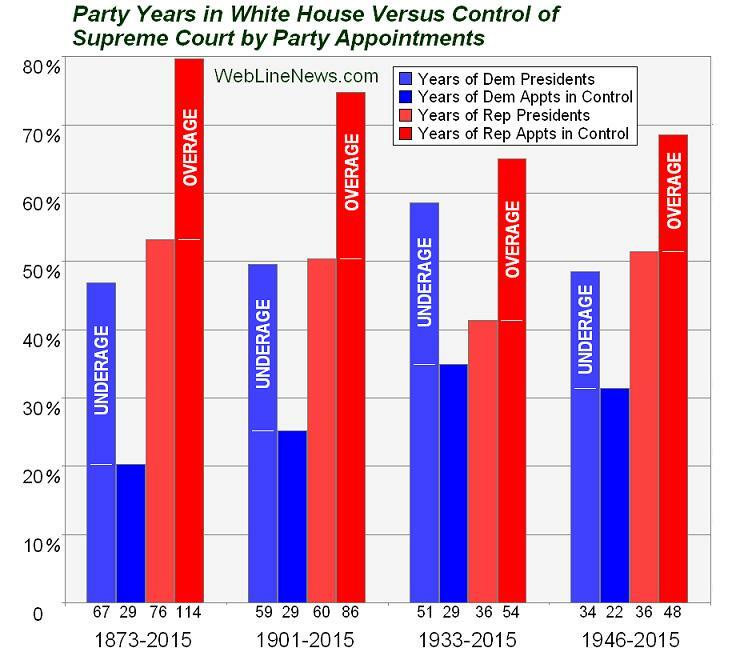 The fourth graph also takes a look at the number of years each party controlled the White House and compares this to the number of years that appointees of each party held majority control of the Supreme Court. Use this chart to see at a glance who served on the Court when an opinion was issued. Note that periods are drawn from the year of appointment, so Justices did not serve for that entire year. The 1896 Plessy v. Ferguson case declaring segregation permissible was decided by a Court made up of six Republican appointees, three Democratic appointees. The 1954 case Brown v. Board of Education reducing segregation was decided by a Court made up of eight Democratic appointees, one Republican. Here is a chart simplified to highlight how many seats were filled through appointments by each party every year since 1873. The brighter area in the middle between the thin lines represents the majority party. Republican appointments have been in control of the Supreme Court with five or more seats most years since 1873. Republican appointees controlled the Court solidly from 1873 through 1938 then again from 1971 through 2015. Democratic appointees controlled the Court most years from 1939 through 1970. Republican appointments held majority control of the Court 72 percent of years since 1873. Meanwhile, Republicans have held the White House only 53 percent of those years, as illustrated on the bar at the bottom of the picture. Republicans have enjoyed a 19 percent advantage over the 143 year period. With Republican majorities on the Court for the vast majority of time, complaints about “liberal” appointments by Democrats cannot be taken seriously. Republicans have had overwhelming control. The third chart compares time in the White House for each party to the number of appointments by each party. There are four separate time periods on the graph. The first section covers the period from 1857 through 2015. During this time, Democrats held the White House for 68 of 159 years or 42.8% of the time and appointed 23 of 80 Justices or 28.8% of appointments. The difference between years in office compared to number of appointments is marked as underage. Meanwhile, Republicans held the White House 57.2% of the time and appointed 71.2% of the Justices. The difference is marked overage. Three additional sections of the chart start at different dates. Each section covers from a start date through 2015. When a vacancy arises, the current administration nominates a replacement. The nominee then receives a fair hearing in the Senate, based upon qualifications. Under this system, Republicans have had a huge advantage in the timing of vacancies — far more than chance or probability would suggest. Even when the unelected president Gerald Ford nominated a Justice, advice and consent was given and the nominee was approved unanimously, 98-0. Few have ever complained that a nominee should be held off for another term. The selection process for Supreme Court Justices is in the Constitution. The Constitution does not require some sort of momentary partisan fairness. If it did, history would not have allowed Republicans to be so favored for so long. A vacancy in 2016 should be filled by the current President both under the Constitution and to reduce the historical unfairness. The fourth chart compares time in the White House for each party to the number of years appointees for each party controlled the Supreme Court with five or more seats. Time periods are the same as Chart 3 except the first one starts at 1873 when the new party realignment finally took shape. Given the fact from Chart 3 that Republicans have appointed more Justices, this chart shows its effect on Supreme Court majority. For three of the four periods, the underages and overages are amplified. More nominations typically grant even more control than the original disparity would suggest. All charts point to overwhelming Republican control of appointments to the Supreme Court for many generations and in recent times. All charts point to a pervasive unfairness favoring Republican appointments. A vacancy under a Democratic president, based on history, the Constitution, and historical fairness must be filled by the current president. Period.